Clogged air filters could add $82 to your electric bill every year. Checking, changing, or cleaning your filter once a month saves money and extends the life of your home’s heating, ventilation, and air conditioning (HVAC) system. More than half of your monthly energy bill goes toward keeping your home comfortable. While air filters prevent pesky dust and annoying allergens from clogging your HVAC system, dirt, like aging arteries, builds up over time. If left unchecked, a dirty filter strains a home’s heart and forces the HVAC system to work harder to push conditioned air through tight spaces. This results in higher energy bills and—potentially—system failure. Air filters protect HVAC systems and perform double-duty by collecting some lose dirt from the air. These handy sieves live in duct system slots or in return grilles of central air conditioners, furnaces, and heat pumps. Successful filters have a short lifespan—the better a filter catches dirt, the faster is gets clogged and must be cleaned or replaced. 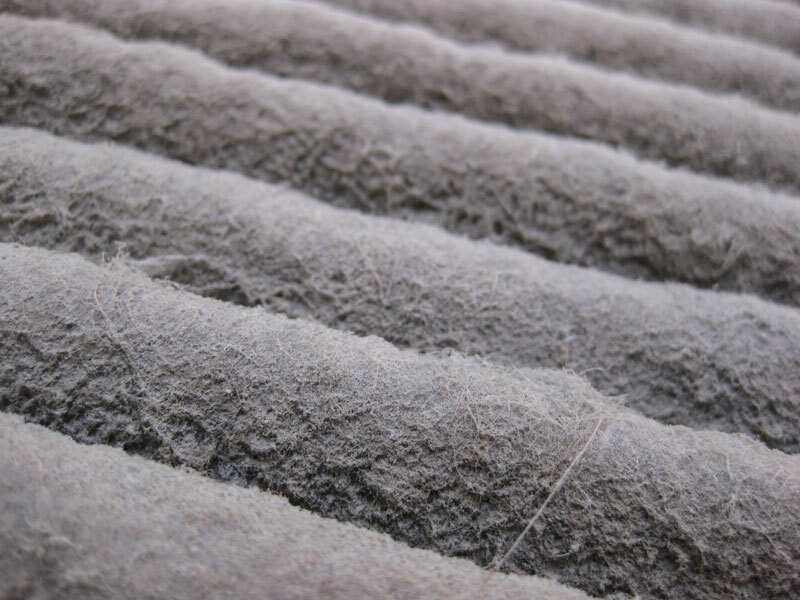 Leaving a dirty air filter in place cuts a home’s air quality and reduces HVAC system airflow. While removing a clogged filter altogether relieves pressure on the system, the system can’t perform well without one. Unfiltered dust and grime accumulate on critical parts like the evaporator coil, causing unnecessary wear and tear. The U.S. Department of Energy (DOE) advises checking an air filter once a month and replacing it at least every three months. It’s critical to inspect and replace filters before seasons of heavy use like summer and winter. If you have pets or smokers in the home, filters clog quickly. Remodeling projects or furniture sanding add more dirt than normal; a filter may need to be changed before the average three-month lifespan expires. Turn your heating and cooling system off before checking your filter. Slide the filter out of your duct work, and look for layers of hair and dirt. Run a finger across the filter. If the finger comes away dirty or there’s a line left on the filter, it’s time for a change. When replacing the filter, make sure the arrow on the filter indicating the direction of the airflow points toward the blower motor. To help schedule monthly check-ups, write the date on the side of the filter so you know when it needs to be checked again. Once you’ve made the change, turn your system back on. Shopping for a new filter? Before you leave home, write down the size printed on the side of your current filter. If you get a filter that’s too small, dirt will get around the barrier and invade your system. There are several different types of filters and levels of efficiency. Filters are either flat or pleated; pleated filters offer extra surface area to hold dirt, making them more efficient. The most common filters use layered fiberglass fibers reinforced with metal grating. Some filters boost efficiency by using polyester fibers. Electrostatic filters are made from positively- and negatively-charged fibers and capture smaller debris—the charge actively pulls particles from the air like iron filings onto a magnet. No power connection is required, and the charge does not fade over time. The filters best able to capture small debris are high efficiency particulate arrestance (HEPA) filters, but these deluxe filters are mainly used in hospitals and office buildings, not in homes. Air filters are rated by a Minimum Efficiency Reporting Value (MERV). Ranging from one to 20, this scale gauges a filter’s effectiveness at blocking debris. Low MERV-rated filters offer high airflow into a cooling or heating system, but only catch large air particles. A higher rating isn’t always better—those filters block more dirt but also reduce system airflow. Most experts recommend filters with a MERV 6 or higher. Manufacturers are not required to post MERV on filter packaging. Brands like 3M’s Filtrete instead list levels of microparticle performance rating—higher numbers mean the filter catches more particles. Home Depot’s Air Filter Performance Rating system ranks filters by good, better, best, and premium. No matter what system a store or manufacturer uses, better (and more expensive) filters mean higher MERV scores. If a family member suffers from allergies, a high MERV filter keeps out excess dander, smoke, and other allergens. Ask a heating and cooling professional what type of filter works best for your home and family needs. Once you find a filter that works well in your home, it’s a good idea to keep spare filters on hand. Basic filters cost anywhere from $2 to $10; electrostatic filters may range from $18 to $25. Before summer hits, clean cooling system coils inside and outside the home. Leaves, dirt, and other debris gather around a home’s air conditioner throughout fall and winter months. These intruders keep the coils from operating at top efficiency, both shortening the lifespan of the unit and ratcheting up summer cooling bills. Just as clogged air filters force your system to work harder, blocked vents strain your system. Clean air registers, baseboard heaters, and radiators. Make sure air ducts are not blocked by furniture, rugs, or window treatments. Want more ways to save? Take the home energy savings tour and see how little changes add up to big savings at www.TogetherWeSave.com. Megan McKoy-Noe writes on energy efficiency issues for the National Rural Electric Cooperative Association, the Arlington, Va.-based service arm of the nation’s 900-plus consumer-owned, not-for-profit electric cooperatives.